That all persons ought to know how to safeguard themselves when in deep water is becoming more and more recognized as time passes. 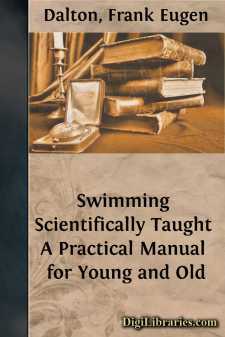 While swimming is probably the oldest pastime known to man, and has had, and still has, its votaries in every country, civilized or uncivilized, it is curious that this most useful science should have been so much neglected. For an adult person to be unable to swim points to something like criminal negligence; every man, woman and child should learn. A person who can not swim may not only become a danger to himself, but to some one, and perhaps to several, of his fellow beings. Children as early as the age of four may acquire the art; none are too young, none too old. Doctors recommend swimming as the best all-around exercise. It is especially beneficial to nervous people. Swimming reduces corpulency, improves the figure, expands the lungs, improves the circulation of the blood, builds up general health, increases vitality, gives self-confidence in case of danger, and exercises all the muscles in the body at one time. As an aid to development of the muscular system, it excels other sports. Every muscle is brought into play. In other important ways it is a useful, and even a necessary accomplishment; no one knows when he may be called upon for a practical test of its merits. The Slocum steamboat catastrophe in the East River, New York, several years ago, gave a melancholy example of what better knowledge of swimming might have done to save the lives of passengers. That awful tragedy, which plunged an entire city into mourning, was too appalling to have its details revived here, but, regardless of the fact that the life-preservers on board were found unfit for use, the loss of life would have been made much smaller had the unfortunate passengers known how to keep their heads above water until help arrived. Millions of people are transported yearly by river craft, and just for lack of knowledge of how to swim a repetition of the Slocum disaster might occur any summer. Only about 20 per cent. of the entire population of the United States know how to swim. A visit to any of the beaches along the Atlantic coast will convince any one of this fact. There is no excuse for this ignorance, especially in a city like New York, with miles of water front and fine beaches at its very door; nor is there excuse in other places where an ocean, lakes and rivers afford opportunities for swimming. Swimming is a tonic alike for muscle and brain. The smallest child and the weakest woman can enjoy it equally with the strongest man. When slaves of the desk and counting-house are looking forward for an all too brief vacation and seek the mountains or seashore to store up energy for another year's work, they should know how to swim. Poor, indeed, is the region which can not boast of a piece of water in which to take an invigorating plunge.